It’s easy as parents to try to communicate with all our children the same. And typically, we tend to communicate with our kids in the way we grew up. Some families look at communication as a way to make sure their kids are tough, resilient, and able to withstand whatever life sends their way. But should we put more thought into the way we communicate with our family? Are we aware, truly aware, of the sensitivity of some of our kids? What might be considered joking and fooling around to one of our kids might actually feel like bullying to another–a feeling of not measuring up. I came from a family where put-downs were commonplace. With five brothers, the game of one-upsmanship was a daily endeavor and as the only girl I learned to play it well. Then, I married into a family where sarcasm was a sport. Quick wit resulted in words spoken with a hint of sting. During our dating years I didn’t know quite how to handle the ridicule, but it didn’t take long for me to learn how to dish it out with the best of them. Words rolled off my tongue as slippery glass ready to take down the next opponent. I’ll admit that at times the sarcasm continued even after we had kids. My husband and I had continued our families’ traditions mainly because that is what we’d learned as normal family behavior. Neither of us were the sensitive type so we’d usually laugh, pretend that we were keeping score, and move on to the next opportunity for a take down. But then we witnessed the same behavior in our kids. Ouch! Talk about seeing yourself in the mirror! Noticing the same behavior from our kids gave us a wake-up call. Dave and I joked about how we were trying to get the genie back in the bottle. It took work, lots of work, to teach our kids to treat each other with kindness and respect instead of sarcasm and contempt. Some learned better than others. 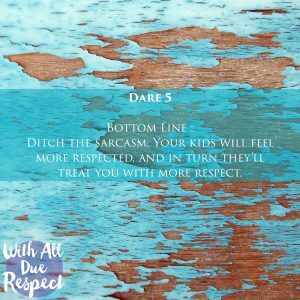 We noticed that a couple of our kids were more sensitive than the others to the verbal sarcasm that was hurled. Others relished in the game. It became a juggling act of the right consistency of discipline for the abuser and empathy for the one with hurt feelings. A few weeks ago it hit me as our pastor spoke on Sunday morning about relationships and the need to communicate appropriately to the receiver. Do we communicate as we’ve been taught to communicate growing up (as in one-upsmanship language or sarcasm and contempt), or do we communicate in a way the other person needs to hear? Here’s another way to think about it. Are we speaking to hear ourselves or are we communicating to be heard from the other person. Our pastor used the analogy of talking with his two kids. With his son he needs to be very direct–laying out the process, making sure he understands. But his daughter is more sensitive. Speaking to her in the same way he speaks to his son would crush her sensitive spirit. She needs the language of respect. Oh my, do we crush our kid’s sensitive spirit with what we see as humor? Is our humor borderline bullying masked in sarcasm? Are we crushing our children’s sensitive spirit and allowing siblings to do the same without much intervention because we don’t know what to do? Old habits are difficult to extinguish even though I’ve worked hard to wipe sarcasm from my lips. When I’m back with my brothers, I can easily slip back into my old ways of communicating and have to ask God for forgiveness. At times I see the old patterns slip in with my now adult children. Just last week I found myself saying something that rolled off my tongue before I gave it thought. Really? After almost 30 years of trying to rid myself of this habit it reared it’s ugly head. I repented and asked the person for forgiveness. I even confessed my sin to my husband, Dave–after all, this is something that we’ve both worked hard on over the years. And then my husband shared with me about what he calls his GEL project. He’s become more aware of the ease with which our adult children have slipped into our old patterns now that we all live in the same city and are together more. 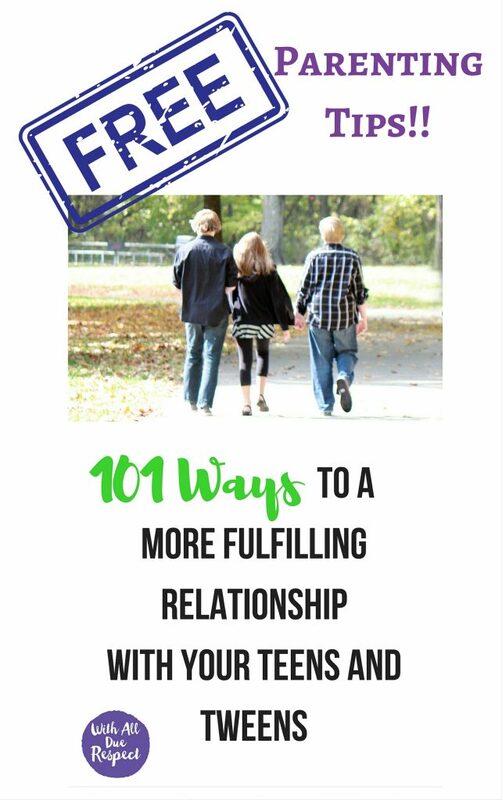 Yes, they’re adults, but we’re still trying to teach in a relationship-type way. Here’s our new mantra. “G” stands for grace. Grace that we extend to the person who violates the ” no one-upsmanship or sarcasm” new family tradition. We also remind that person that they need to extend grace to the person who they feel the need to put down. All we have to do is say the word grace and the offender knows what we are talking about. “E” stands for empathy. Each of us needs to extend empathy to the other person for the mistakes they make, for not measuring up, or for things that sometimes happen to them. We learn to understand the feelings the other person has and listen when they voice their frustration of the words spoken to them. Empathy is especially needed in communicating with those who are more sensitive. “L” stands for love. We love each other as 1 Corinthians 13:4-7 Love is patient, love is kind. It does not envy, it does not boast, it is not proud. It does not dishonor others, it is not self-seeking, it is not easily angered, it keeps no record of wrongs. Love does not delight in evil but rejoices with the truth. It always protects, always trusts, always hopes, always perseveres. Dare you to look at the way your family communicates and take action on whatever needs to change. Maybe you should institute a GEL project in your home. 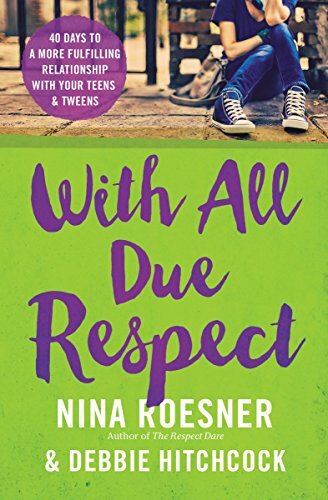 Awareness of how we are to treat others will not only change the culture in our homes, but if we can teach our kids to take it out into the world, who knows what changes might happen. Interested in leading a parenting Bible study that will have women sharing on a deep level from the beginning? Want them to walk away with a WOW! experience? 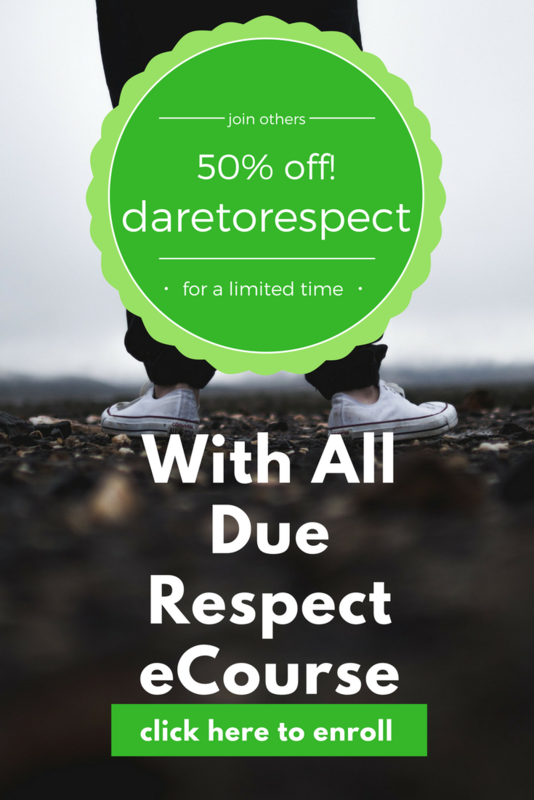 With All Due Respect will do just that and we promise to make it easy to lead. You don’t need to be a perfect parent; you don’t need to have perfect kids; and you don’t need to have ever led a group before. For the next month we’re offering our new Small Group Leader’s Guide for only $5.95 so you can get your small group started right away. That means you can start a group at a greatly discounted rate! 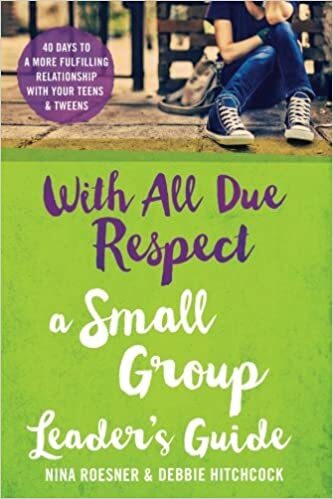 Our Small Group Leader’s Guide is an easy-to-follow guide that will give you questions, exercises, and opportunities to engage with other parents as you think about your own parenting. If you know a mom who has kids that are 9 or 29 this study will be life-changing as they think about parenting. You can even get suggestions on how to run your groups from me. I love to engage with other moms and leaders and you can reach me through the website atwww.greaterimpact.org. So grab your friends, and grab a copy of the Small Group Leader’s Guide here . Thank you, Debbie. My words have been more filled with contempt than sarcasm, but God is helping me change them for my husband’s sake. This is a passage to memorize so I can test my words before they leave my mouth. Kathy, being aware of our tendencies is half the battle. It sounds like you’ve moved from unconscious incompetence, through conscious incompetence, and are now in the conscious competence stage. It’s a learning process that means you are aware of your need to change and have a way to stop yourself before the words leave your mouth. Praise God in the small steps of becoming more like Him! And when you mess up, as we all do, apologize and keep working. Glory to God for what he is doing in you! May His light shine through you to your family and those who come in contact with you. Blessings to you.